BooksNovogratz, Jacqueline (2009), The Blue Sweater: Bridging the Gap Between Rich and Poor in an Interconnected World, New York, NY: Rodale Books. BooksNoya, Antonella (ed.) (2009), The Changing Boundaries of Social Enterprises, Paris: Organisation for Economic Co-operation and Development. BooksNunn, Michele (ed.) (2006), Be the Change: Change the World, Change Yourself, Atlanta, GA: Hundreds of Heads Books. BooksNyssens, Marthe (ed.) 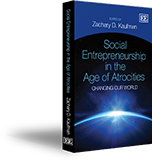 (2006), Social Enterprise: At the Crossroads of Market, Public Policies, and Civil Society, New York, NY: Routledge.